The Seattle Mariners shared Safeco Field’s new HD video screen with the media and will do the same on Monday, April 1st (No April Fools Joke) at 6 pm for the season opening game against the Oakland A’s. A Sports Technology innovation like this by Panasonic HD makes going to 81 home games during the 2103 season a real treat for all baseball fans inside the Safe. 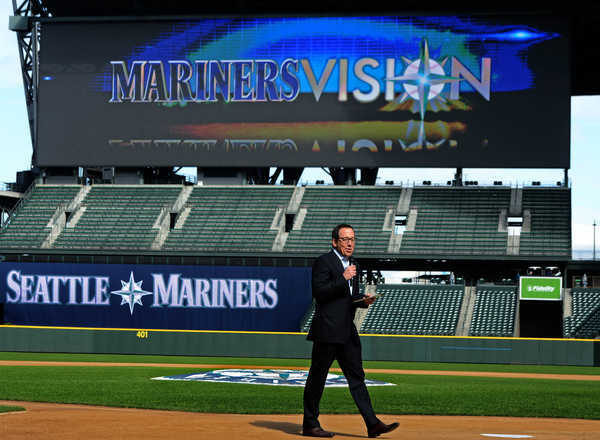 Mariners Vice President of Marketing Kevin Martinez said, “Fans will never watch Mariners baseball at Safeco Field the same way again.” It is the Sports Techie honor and privilege to blog about this epic and historical sports tech occurrence. Kevin Martinez, the Mariners’ vice president of marketing, shows off the new MarinersVision scoreboard. The massive screen specs measure 56.7 ft. high by 201.5 ft. wide, covering 11,425 square feet which makes it the biggest of its kind in Major League Baseball. This screen is equal to 2,182 42-inch flat screens. The screen is also crystal clear with 4,147,200 pixels, even more than the Cowboy’s Stadium HD video screen. The resolution is better than what you can get on your HD TV at home, according to the Mariners. The unique video board combines 1080p x 3840 screen resolution and surface-mount LED technology. The entire MarinersVision HD video board displays nearly 10 times the video amount of a non HD screen. The Panasonic HD video board overtakes the one at Kansas City’s Kauffman Stadium (84 x 105 ft., or 8,820 sq. ft.) as well as those at both Cowboys Stadium (72 x 160 ft.) and Charlotte Motor Speedway (80 x 200 ft.) to become the largest in baseball and the widest in American professional sports. It immediately ranks as North America’s third-largest sports venue video screen, behind Daytona International Speedway and Cowboys Stadium in Arlington, Texas. Advanced Graphics, 3D animation, HD video and more in depth statistics are displayed in exceptional clarity from any angle, even with the fading sunlight over the Olympic Mountain on a warm summer night. Replays will be enhanced by four manned cameras as well as a fifth camera over center field, operated from a booth in the press box broadcast center. The Mariners will be able to program the video board for a single, live-action shot or video replay or segmented for graphics, animation, statistical data, or digital signage. Besides tracking the traditional stats of runs, hits and errors – a statistical chart for batters will include such “advanced” statistics as on-base percentage, slugging percentage and OPS, a combination of the two. Martinez stated that when Safeco Field fans were asked for ways to improve their ballpark experience, the “No. 1 suggestion” was an upgraded scoreboard. The screen replaces the previous scoreboard, which was built in 1999, the inaugural season of Safeco Field. In addition to the video-board upgrades, the Mariners completely replaced their scoreboard-control room. Located on the 200 level behind home plate, the Safeco Field control room had been entirely SD and analog since 1999. Integrated by Diversified Systems, the overhauled control room features a Ross Video Vision 3 switcher, XPression 3D character generator; and BlackStorm playout server; Evertz Xenon 96×96 video router, terminal gear, and multiview processor; two six-channel EVS XT3 replay servers; and ANC Sports VisionSOFT 64-bit operating system. The team also selected two Grass Valley LDX Première camera packages, a Sony PMW500/HD02 camcorder, FUJINON long- and short-range lenses, and three Canon HD POV cameras, according to SVG. The total cost of MarinersVision HD video board behind the center-field bleachers caps a four-year, $15 million maintenance and capital-improvement project that included changes in the outfield wall dimensions and a new open-air cantina in left field. 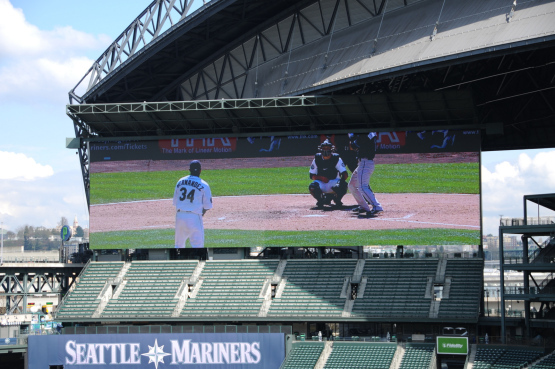 The Mariners are keeping the total cost of the HD screen a secret for now. Fans will have their first chance to see it on Monday, April 1, at the free Safeco Field Open House so bring your smartphone and post pictures and comments about MarinersVision on your social media networks. Parking in the Safeco Field and CenturyLink Field garages is free. Gates open at 6pm. The Mariners vs. Oakland A’s game will be shown live on the HD MarinersVision, and there will be $5 beer, pizza and hot dogs. Sports Techie, MLB Spring Training has officially ended and now is the time to start thinking about supporting the Seattle Mariners or whoever your MLB team is, to win the pennant. One way to support is via social media. Tweets from fans will appear periodically on MarinersVision. Look for Sports Techie social network postings throughout the MLB season from various ballparks. Last year, I tweeted from Seattle during the 17th inning game against the Baltimore Orioles when the east coast was fast asleep, hoping to make the video board but to no avail. 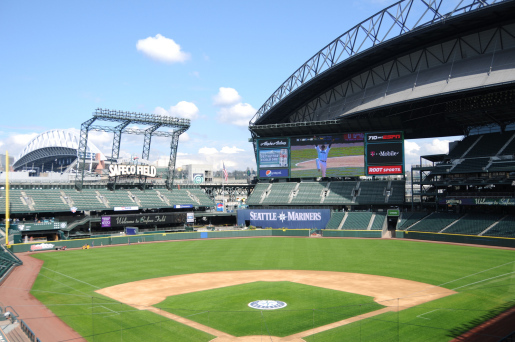 This year, look for our tweets on Monday from the Safeco Field hashtag #OpenHouse with the same goals in mind as last year, cheering the team on to victory and getting on the new Panasonic HD MarinersVision. “This is going to be the most interactive fan-focused venue in all of sports,” Martinez said. I will see you this Monday at Safeco Field, tweet at me if you want to visit and share your thoughts on MarinersVision sports technology. This looks like a fantastic addition to the park. However, I am disappointed that the Mariners consider stats like on-base percentage and slugging percentage to be advanced metrics. There is SO much more teams can do with analytics to enhance the fan experience. The irony is that they could do that for one percent of what they paid for the video board. They could even partner with sponsors to monetize such statistical content.